"Well, I can’t say it’s true, and I won’t say it’s not, but there’s been talk." For our letter writing interests we are looking at Telegraph Stamps for kicking off the new week! 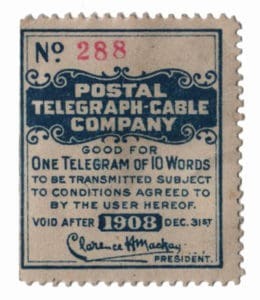 The image I’m showing is of the 1908 Postal Telegraph-Cable Company. 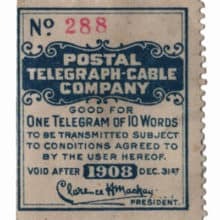 To begin with, over at This Day in History, today 1911 August 20, History.com they are remembering the “First around-the-world telegram sent, 66 years before Voyager II launch”. More on that in a minute. Furthermore, to read more about the Telegraph Stamp, click here for Mystic Stamp Company Telegraph Stamps – Document the Growth of America. We are looking at this article over at History.com today; I’m including the link here for reading more about it. Before wrapping up, a warm welcome to the new email blog subscribers here at AnchoredScraps! In conclusion, thank you for joining me today. Even in the midst of so much rapid change, I love being able to be in both the now digital and analog worlds – all the while with connecting with snail mail.